Hotaru is a young girl in elementary school. Due to her parents work she has had to move from Tokyo to a small country town. The schoolhouse, while rather large, only uses a single room. Inside that one room are all 4, now 5, students in the town. They range from 1st grade to 9th grade. Hotaru, along with the 3 other girls in the classroom, spend the following year getting to know each other. This is for sure not a school anime in the usual sense. Most of the stories do not even take place in the schoolhouse. 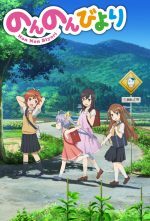 The only single theme throughout the show is following the four girls around town as they get to know each other, and as Hotaru gets accustomed to life in a small country town. There is a single scene, during the closing credits (which technically means it happens 12 times) having the 4 girls in the path together for about 5 seconds. The water is green (eww?) and all that can be seen is an extremely faint outline of their bodies. Frankly, you probably see more on cereal boxes. Since these episodes do not follow a specific plot it makes a great show for watching at random times. Each episode is somewhat unrelated from the others so there is no worry of getting lost in the plot by forgetting what came before. Each episode has lots of comedy as we see Hotaru getting used to country living and the three country girls pretend they don’t actually live in the country, even though the movie rental store is ten bus stops away.